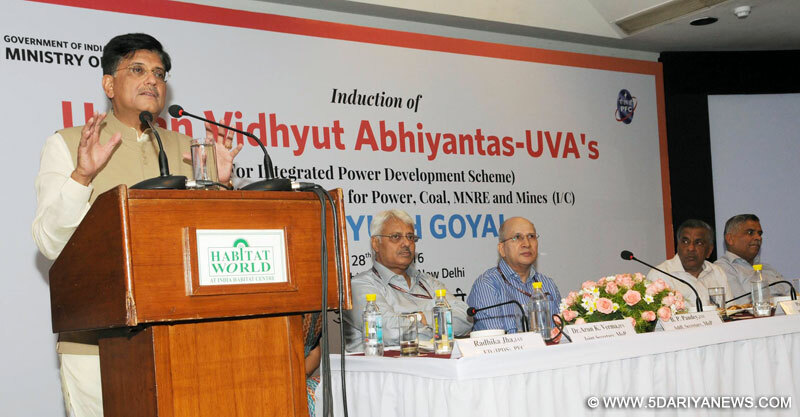 The Minister of State for Power, Coal, New and Renewable Energy and Mines (Independent Charge), Shri Piyush Goyal addressing the Urban Vidyut Abhiyantas-UVA’s, at a function, in New Delhi on July 28, 2016. Piyush Goyal, Union Minister of State (IC) for Power, Coal, New & Renewable Energy and Mines inaugurated here today the Induction program of Urban Vidyut Abhiyantas (UVAs) to be placed in State Power Distribution Companies (Discoms).Speaking on the occasion, Shri Piyush Goyal said that these UVAs are the missionaries of technology. He asked UVAs to take their work as a mission rather than a job. The Minister said that while you work by taking forward the Integrated Power Development Scheme (IPDS) scheme and monitor that the scheme is implemented honestly .The Minister interacted with newly recruited UVAs and motivated them to work with full commitment in their respective Discoms and be a part of nation building and create a movement towards better Power. Goyal further said that the most critical feature of the success that we have achieved so far, and what we hope to achieve in the next three years is cleaning up every system to make it corruption free, making sure that the quality standards of highest order are maintained in our work and the entire infrastructure that we are going to create is robust, sustains the needs of this country for years to come and leaves behind a legacy that the nation can be proud of. Stressing on the need for transparency and accountability, the Minister urged everyone to monthly monitor on “URJA” Mobile app (www.urjaindia.co.in) and seek better services from their Discoms.Ministry of Power has taken up this innovative experiment of placement of young professionals called UVA’s to assist the Discoms in effective monitoring of Integrated Power Development Scheme (IPDS), with an objective to create synergies and better coordination amongst all stakeholders.These UVA’s having an experience of 3 to 15 years in Project Management/ Distribution Franchisee/ Infrastructure Sector shall be positioned in every Discom. After the success of Grameen Vidyut Abhiyantas (GVA’s) in expediting rural electrification across the country, the role of UVA’s is envisaged in supporting the Discoms towards urban distribution strengthening and IT enablement initiatives leading to enhanced Consumer Connect. The innovative experiment by the Ministry of Power(MoP), of the placement of young professionals- UVA’s, would assist the Discoms in effective monitoring of IPDS. This would further create better synergies and coordination amongst all the stakeholders. These UVA’s with an experience of 3 to 15 years in Project Management/ Distribution Franchisee/ Infrastructure Sector, shall be positioned in every Discom.On the lines of GrameenVidyutAbhiyanta (GVA’s), which has witnessed a huge success in expediting the rural electrification across the country, the UVA’s are expected to support the Discoms towards strengthening of urban distribution and IT enablement initiatives. This would lead to enhanced Consumer Connect.